Pienza, San Quirico d'Orcia, Montepulciano, Montalcino, and Chianciano Terme are located fairly centrally in Tuscany and each is an easy day trip from Cortona, Florence, Siena, or most parts of the province. There are outstanding views from the winding roads and many castelli and cantine which allow "drop-in" tasting and sell the wines and olive oil produced on their estates. Originally named Corsignano, Pienza was slated in Renaissance times by Pope Pius II (born here in 1405) to become a model town. However, his designs were never realized beyond a few buildings around the main piazza within the walls. Primary buildings are the Duomo (constructed by Rossellino in 1459), Palazzo Piccolomini (Enea Piccolomini was the birthname of Pope Pius II), and the Pieve di Corsignano (11th century church in which Pope Pius II was baptized). Nevertheless, Pienza is a small and charming town in the lovely Tuscan countryside. Also worth seeing is nearby (~5 km from Pienza; just off the road towards Trequanda) Sant'Anna in Camprena which was the location used as the set for the movie "The English Patient" ; and (~7.5 km from Pienza) San Quirico d'Orcia which is on the way to Montalcino. Although not as well-known as the Chianti region, this area contains Montalcino, the home of the excellent Brunello wines by Banfi and other producers, as well as Montepulciano's Vino Nobile and Vino Rosso. Montepulciano is called "The Cathedral of Wine" and 55% of its production is exported, primarily to Germany, Switzerland, and the USA. 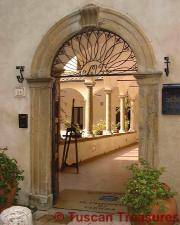 If possible, visit during Wine Day (May 26, 2013; last Sunday in May annually since 1998) when most cellars are open for tastings. Wine tours are offered by the "Strada del Vino Nobile di Montepulciano" every Thursday from May to October; the tours depart at 15.00 from Piazza Grande, 7 in Montepulciano and reservations must be made in advance. For groups of at least 6 people, wine tours can be organized on alternate days. Further information and reservations can be made by calling (0578) 717484. Montepulciano is located on a ridge which is about 600 m high. It is surrounded by walls which were erected on the orders of Cosimo I. The church of Madonna di San Biagio, started in the early 1500s and masterwork of Antonio di Sangallo, stands outside the walls. The connection between Montepulciano and wine production has been documented as far back as 790AD; with numerous personages (among them Sante Lancerio & Francesco Redi) through the centuries lauding it as "exquisite" and "the king of Wines." The principal wines produced are Rosso di Montepulciano (80% Sangiovese - aka Prugnolo gentile - & 20% cannaiolo nero) and Vino Nobile di Montepulciano (80% Sangiovese, 15% Cannaiolo nero, & 5% Mammolo). Vino Nobile di Montepulciano first received the DOC designation on July 12, 1966 and the DOCG designation in July 1, 1980. Montepulciano also produces white wines (typically 50% Malvasia & 50% Trebbiano), Chianti Colli Senesi, and Vin Santo. Montalcino has been well-known for production of red wines since the 1400s and is renowned today for their Brunello. Brunello (from Sangiovese grapes) was invented by Ferruccio Biondi Santi; his first bottling was in 1888 and the winery is still in business today. Further, Brunello was one of the first Italian wines to receive the DOC (1966) and DOCG (1980) designations. Aging requirements for the wines of Montalcino vary, from 2 years for Rosso di Montalcino to 5 years (2 at least in oak) for Brunello, and 6 years for Brunello Reserve. The 14th century Fortezza provides outstanding views over the adjoining countryside. Monticchielo, not far off the main road between Montepulciano and Pienza, is best known for its plays titled "Teatro Povero", which are presented in July and August. Pienza -charming small town & birthplace of Pope Pius II. By car: From A1 (either north- or southbound) take the Valdichiana exit. After you pay your toll, turn to the left onto SS327. Continue on it through Torrita di Siena and follow, for ~25 km, the directions to Pienza (which is on SS146) - you can go either via Montepulciano or bypass it. Montepulciano is on SS146 ~25 km.east of Pienza, Chianciano Terme is ~9 km SE of Montepulciano on SS146 and Montalcino is ~35 km west of Pienza (to reach Montalcino go West from Pienza through S. Quirico d'Orcia, then direction Torrenieri and from there follow the signs to Montalcino. If coming from below Chiusi on the A1, you can also take the Chiusi exit and take SS146; follow the signs to your destination city. By air: Florence's Amerigo Vespucci [FLR] and Pisa [PSA] are the closest airports; Rome's Fiumicino [FCO], Milan's Malpensa [MXP], and Bologna [BLQ] airports are also convenient. Auto rental: The closest major rental car companies are in Arezzo; Avis is across from Arezzo's train station in Piazza della Repubblica 1/A. The Hertz location is in a suburb. Tamburini, the Alfa-Romeo dealer in Camucia, rents cars for short or long periods at very favorable rates. There are also rental companies in Chiusi.